Buy the premium FORNO Barbecue at Taylor Made Planters with a 5 year warranty and get set for a summer of great food. Add a quality outdoor barbecue to your garden and enjoy the benefits of alfresco dining this summer. 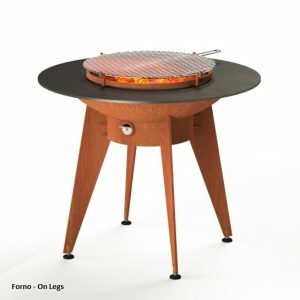 The FORNO Corten Steel BBQ offers a new world of possibilities for outdoor cooking with an innovative design that allows you to grill and bake at the same time. The spherical fire bowl features a thick Carbon Steel roasting plate that serves as a plancha or teppanyaki and the unit includes a fire control button to make it easy to barbecue at different temperatures. The centre of the roasting plate is warmer than the outer ring so you can prepare a variety of different food at once and easily cook up a feast for your friends and family! Strong and adjustable legs are included with each cooking unit. Choose from 4 base sizes to suit your outdoor living space.